HENLEY 1sts crashed to a 4-1 defeat away to league leaders Oxford Hawks last Saturday in a match that was closer than the scoreline suggests. 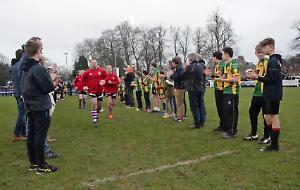 Despite early chances for the Henley front line of Green, Land and Foster, it was Oxford Hawks who scored twice on 15 and 20 minutes, punishing two misplaced passes by the visitors. Despite some flowing hockey from Henley throughout the first half, with youngster Fred Newbold showing good skill on the right wing, Hawks remained 2-0 up at half-time. Five minutes into the second half Hawks scored their third, again from a Henley error, which proved to be costly. Despite the three-goal deficit Henley pulled a goal back through Alex Land, displaying some quick reactions to deflect Benji Hetherington’s through ball past the Hawks’ goalkeeper with 15 minutes to go. Chances to add a second came and went for Henley, and it was Hawks who sealed the match with five minutes to play with a well-taken breakaway goal. GUY HARMER netted a hat-trick as Henley 2nds eased to a 5-1 MBBO Division 1 win against basement side Ashford 2nds. Henley started brightly with good attacks down both flanks by Rechner on the left and Measures on the right which promised much, including a number of penalty corners, but ultimately the home team lacked the finishing touch. After 15 minutes Doyle latched on to a poor clearance and shot powerfully at goal where Harmer was on hand to get the final touch. A second followed when debutante Timothy Herbert was picked out in the D, controlled the ball well, and spun 180 degrees to slot the ball past the Ashford keeper. Harmer was then given the ball with the keeper to beat and he duly dispatched it to the corner of the goal for his second to make it 3-0. In the second half with some unselfish work by Price and Herbert in midfield, the Ashford defence fell apart again and Harmer was well positioned to power in his hat-trick goal and make it 4-0. Ashford then pushed players further up the pitch to apply pressure on the Henley defence where they eventually pulled a goal back. This proved nothing more than a consolation goal and moments later Rechner’s mazy dribble brought him to the top of the Ashford D where he fired home. HENLEY 4ths ended up on the wrong side of an eight-goal thriller against top-of-the-table Reading in a hard fought end-to-end game at Jubilee Park. The amber and blues were fast out of the blocks taking the game straight to Reading being in the ascendancy from the start. Henley almost scored in the first five minutes with Tim Cima going close following good work from Ian Rechner in midfield. Henley kept the pressure on and a few minutes later Ewan Watkins broke down the right drove to the byline and crossed for Jules Aplin to fire home. Reading were now on the back foot and minutes later Ewan Watkins made the same move down the right and his cross was again met by Aplin who swept home to put Henley 2-0 up. Reading responded by adjusting their formation and slowly clawed their way back into the game, by exploiting an overlap down the Henley left and despite a good first save by Ryan Foggia managed to scramble the ball over the line. The visitors continued to push and were only denied a second by a last-ditch goal line clearance by Jon Wiliams. Worse was to follow for Henley with defender Simon Ward suffering a heavy knock on the knee and forcing him off. Again Henley responded and following the award of a long corner on their right the ball was quickly moved by Martyn Watkins to Ewan Watkins who once again used his skill and pace to get to the byline and cross this time for Neil Emmett to convert to make it 3-1 at half-time. The second half began with the return of Ward to the fray, but within minutes his central defensive partner Adam Warner limped off with a torn hamstring. Henley regrouped but gaps were beginning to show and Reading forced a short corner from which they scored with a well worked routine. It was now all Reading and worse was to follow when Ward again went down injured and had to be replaced. With both central defenders now missing Henley were struggling and in minutes Reading scored two quick goals to take a 4-3 lead. Henley were now throwing caution to the wind to try and find an equaliser and it looked possible with Simon Taylor getting off a quick shot in front of goal only for the Reading keeper to deny him. Reading countered and with the clock ticking down forced another short corner, the same routine was used and again a good goal scored with a flick into the net to secure a 5-3 victory. Henley 4ths: R Foggia, D Rechner, A Warner, M Watkins, S Ward, J Williams, S Taylor, E Newbold, N Emmett, E Watkins, T Cima, I Rechner, J Aplin.